I have to warn you: these are dangerous baked goods. Please do not make my mistake of making a batch when there are only two of you to eat them. You will eat them all. Mum and I are very good at portion control. We'll have a slice of something, a bite of this, just one biscuit. We both exercise a lot and try to keep a healthy diet despite my baking. We usually have one square of chocolate with our bedtime cup of tea - never more. Because of this, I thought it would be fine to make a batch of deep fried gorgeous choux-like pastry covered in cinnamon and sugar and dipped into what is essentially dark chocolate ganache. Absolutely fine. It was my first time deep frying - simply an experiment. I'm afraid not. We ate every single one. Mum even ate the last few when they were cold and slightly limp. Oh dear. Then we didn't manage to eat any supper (unheard of in our house) because we were so stuffed. We're not proud. The problem: they're just so good. Addictive. Moreish. How can you possibly resist? 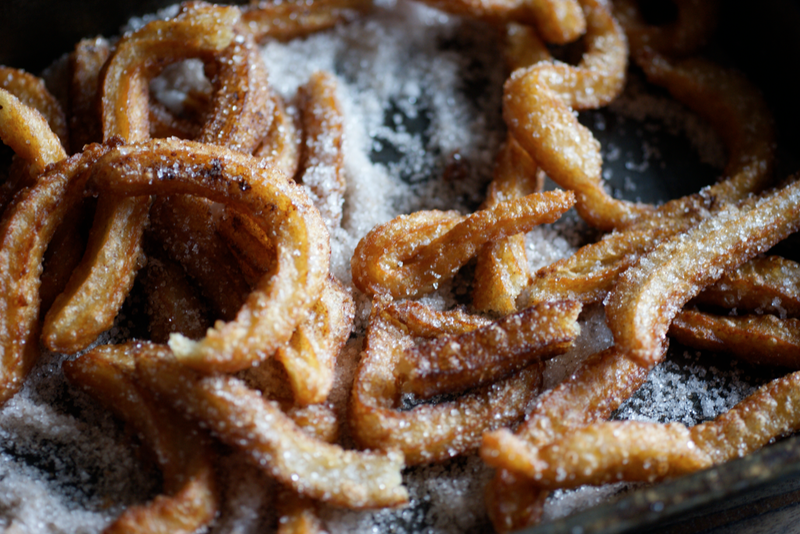 I first came across churros in my Spanish GCSE class: our teacher couldn't stop mentioning them. Then we went on a trip to Barcelona (such a gorgeous city) and actually ate them. They were wonderful, but not quite as spectacular as I was expecting. I reckon they weren't that fresh because just out of the pan these are better than I had imagined. When I had finished with my spices (cinnamon, star anise, vanilla) from the Spiced Caramel and Pear Bundt Cake, I put them in a jar of sugar to infuse. I used this sugar with extra cinnamon to toss these in. When you open the jar, the smell is fantastic. I don't mean in any way to dissuade you from making these. They're amazing. Just get a big group of friends over and enjoy - they would be a perfect fun dessert or tea time snack. They're traditionally eaten for breakfast but I don't think I can cope with that. Bravo to you if your stomach can take it! Chop the butter up into cubes and put it in a medium saucepan with the water, salt and sugar. Bring to a low boil (the butter will melt into little droplets and the water will colour). Add the flour and beat well until the it comes into a shiny ball. Take off the heat and beat for 2 more minutes. Let cool a bit then add the egg and beat again, then the vanilla and beat again. Transfer to a piping bag with a medium star tip. Set up some kitchen towel ready to soak up excess oil and a platter/tin with the sugar and cinnamon in. In a medium saucepan or shallow pan with high sides, heat 2-3 inches of the canola oil to 375F/190C. Pipe a few inches of the dough into the oil, being careful with your hands and the oil. Cut it off with a knife or a finger. It will bubble and sizzle vigorously and then calm a bit and start to brown. Turn over when it seems to be fairly brown and cook until totally golden. Use a slatted spoon to remove to the kitchen towel and then the sugar/cinnamon mix. By the end I could do three or four at a time. I found it was much prettier and easier to let the dough squiggle and curl than faff about them being straight. Try to eat while they're still hot or warm! Put the cream, cinnamon and sugar into a small pan and heat until nearly boiling. 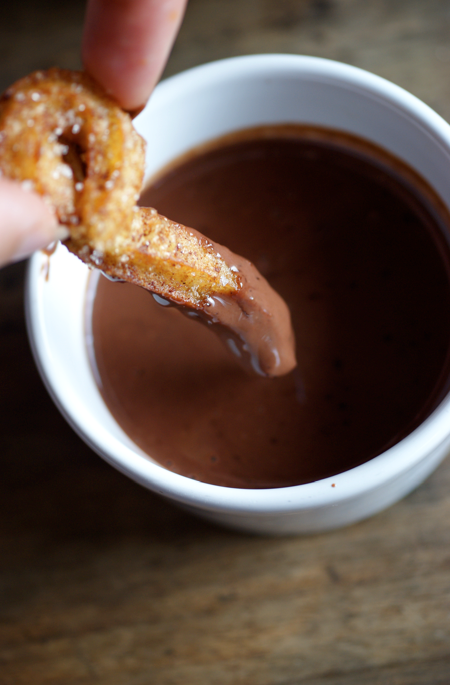 Chop the chocolate up and place it in a small bowl. Pour the cream mixture over. Leave it for a few minutes then stir until smooth. Oh, yes. They are bad. You just can't stop eating them. Thanks for sharing the recipe. 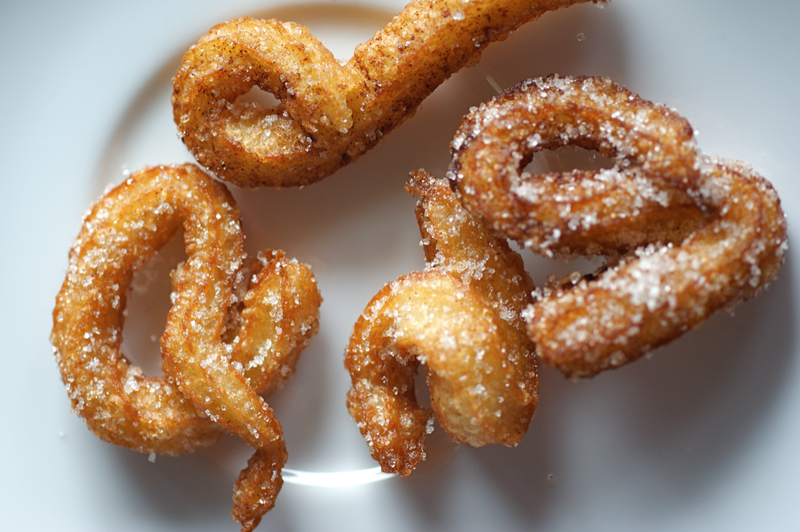 Your churros look very delicious. 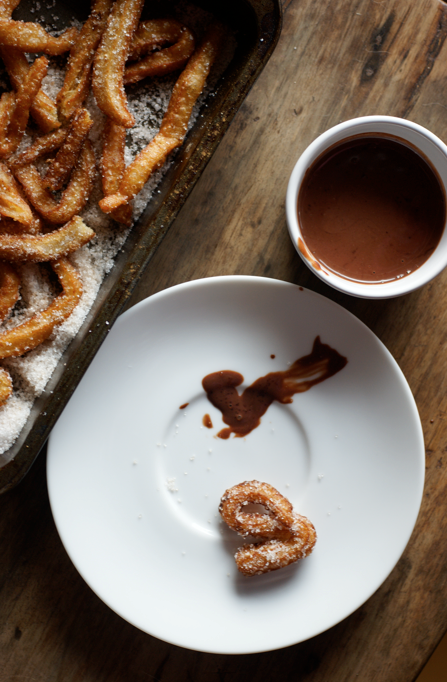 Yum, I love these but ashamed to say I never make them as living in Spain they are so easily available and there are some recipes where life's just too short to make homemade! I would have done the exact same thing. Yum. 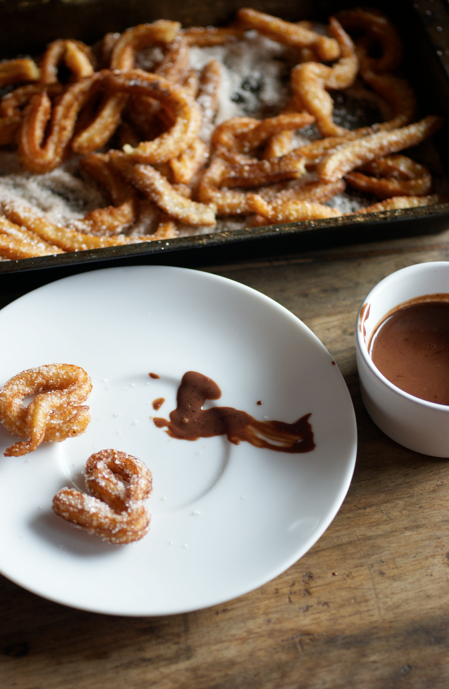 Mmmm, churros! 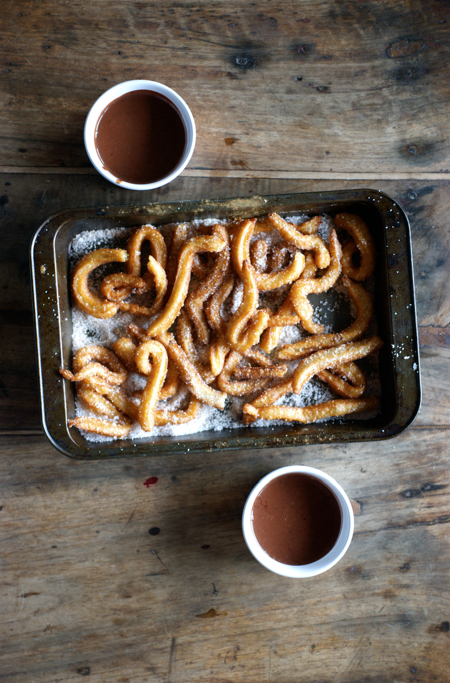 These are one of my favorite indulgences, but I've never made them at home. They look super delicious! oooooh! just like the ones from totnes market Em! yum yum! Man they look good! And hey, at least you skipped supper, so that kinda makes up for eating the whole batch, right?